“I just don’t understand how we can be so far off schedule?” I was staring at the reality of the latest monthly progress review and trying to decide just how many floors the General Manager would blow through when he hit the ceiling on getting this news. I signed and pushed out of my office doing my best to ignore Hogarth. ” Seriously?” I rolled my eyes. “Fine, just remember, you promised not to bother…” WHAM! After picking myself back up from the floor I looked to see who the heck had left one of the rolling file cabinets in the middle of the hall. Only problem was I was looking up at the side of a cube wall. I’d not only not stayed in the middle of the hall, I’d veered into one the side halls and then into the wall of the corner cube. 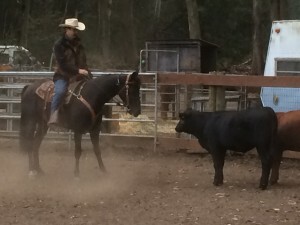 How is making your goals like riding a horse? Some time back I introduced you all to Peet, my horse. At the time Peet was helping Hogarth and I explore a point regarding too much focus on work being bad for you. 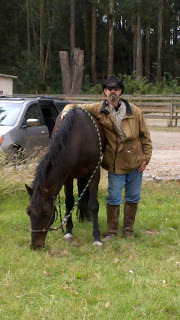 Today Peet and Sky, my wife’s horse, are back to help us demonstrate why keeping the goal in sight is so very important. If you ride a motorcycle, you already know what I’m about to demonstrate. About twenty years ago, my girlfriend (now wife) told me I had no business ever riding a motorcycle. She said something to the effect that I didn’t have the focus. Being an overly confident young man I naturally disagreed with her. I mean I was a guy, I could do anything right? Well luck, fortune, or fate prevented me from realizing my dream to own a BMW Touring bike. This was one of those times to be thankful for unanswered wishes. What Peet demonstrated to me that day was the principle of “you go where you look.” In the opening photo is another very real demonstration. When cutting cows (herding), if you don’t keep your eye (and the horses eye) on the cow, they will happily go where ever they want. If I were to have looked away (I did), then Sky would have (he did) and the cow would have run back to the heard (she did). When you drive a car, the car is amazingly forgiving. If you look off to the side of the road, you don’t immediately swerve. You will, given time, but the car is very forgiving. Horses and motorcycles are not if you lose focus, if you start looking at something on the side of the road, very soon you’ll end up on the side of the road. Your entire body shifts when you look and aligns to move in the direction you are looking. With horses and bikes you see this effect very easily. And the principle applies to goals and objectives as well. My mind really made the connections this week, when I attended the Bay Agile Leadership Network. Dan Kimble of Resonance Executive Coaching came to speak on the topic of the Leadership Crisis in the Digital Age. Dan has done competitive motorbike racing and drew the example between where you go on a bike and where you go with your goals. Being a horseman (who once nearly rode his horse into a tree) I instantly saw what he meant. Think back to high school and the English final. You know, that multi-page essay about some book that at the time you would have rather read anything but it? You had a whole month to do the project. Yet how many of us didn’t even put the first word down until the week it was due? And how many of you wrote the entire paper the night before? When we don’t keep our goal in sight, we don’t reach our goal. Back in 2013 I expounded on not Multi-Tasking. This is not just for your day to day work, it’s for your goals as well. Try not work on two life goals in the same week, neither will get the proper attention they deserve. Since you’ve already broken these goals down into tasks (you have, right? ), just focus on one task at a time and if a week is like an agile sprint, and the goal the product, work on only one product at a time. Let’s pull a page from the agile community and hold our very own daily standup. Every day a Scrum team gathers around the task board and go through the three question ceremony. When they do this, they are not just reviewing what happened yesterday and what they plan to do today. They are also focusing again on their goal. The backlog shows their goal for the Sprint and every day they are focusing back on that goal. When you only review program status once a week, that’s four business days (and a weekend) to get distracted and end up completely off track. So every day, connect with your goals again. This can both be your current work goals (what you’ll do this week) and more importantly your purpose goals. This won’t take long, just five or ten minutes a day. Your purpose goals should be no more than five at any one time and you can only do so much work in a week so don’t overwhelm yourself. Just reconnect with your goals so you can get to them at the end of the ride instead of running into the wall.